In December last year we revealed the winner of the grand prize of WYSE Travel Confederation’s New Horizons Survey. AuPairWorld, the agency that helped this young woman to pursue an au pair experience in Finland, encouraged participation in the New Horizons global survey of youth travel. The lucky 22-year old winner of the grand prize, which was two Emirates flights to anywhere in the world, was Aldara Robredo Corta of Spain. 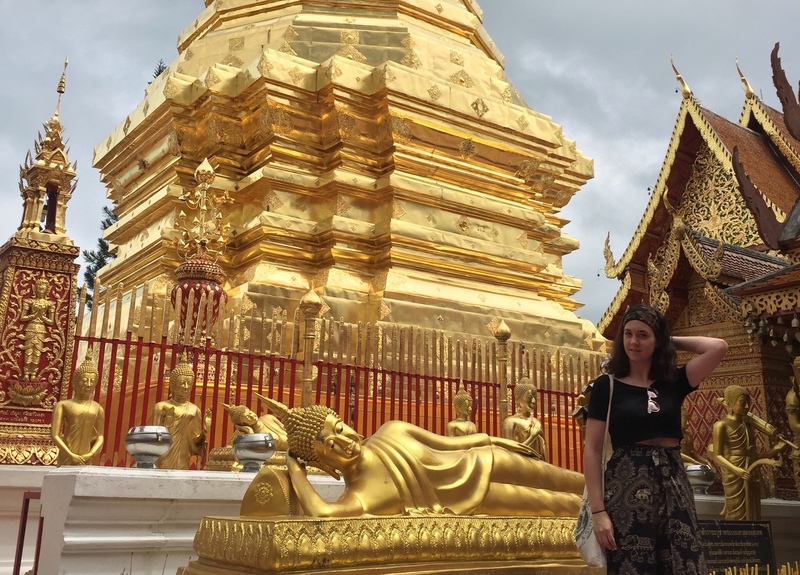 In July, Aldara and Miriam set off to Thailand for a few weeks, partly backpackers, partly tourists, but 100% devoted to learning about the country and the culture. They visited Bangkok, Ayutthaya, Chiang Mai, Ao Nang, Railay, and Phi Phi before flying back to Spain from Phuket. Amazingly, the only difficulty that they reported encountering during the trip was… stormy weather on the Andaman Sea. “We had zero problems. One of the main reasons we chose Thailand as our first time in South East Asia was how well prepared they are for tourism, but we Googled a lot and knew what we wanted to visit. When we landed we were quickly slapped by the heat of the city – but flying with Emirates was really comfortable! They treat you so well and they offer a huge variety of entertainment so time literally flies in those aircrafts. The city was just as I thought it would be: chaotic and somehow decadent… but at that moment I didn’t have any idea how much I would end up loving so many of the places we visited in Bangkok. I tasted my first pad thai, which ended up being the best. I must say, Thai cookery was one of the trip highlights for me. Also, I found it interesting the importance they give to the street food markets – these are not only nice tourist attractions, but they serve as a meeting point for people living in the area or a place to eat for those coming and going to work. We stuck to a low budget for almost all of the trip, which wasn’t difficult because Thailand is cheaper than countries we are used to in Europe. However, we treated ourselves in Phi Phi staying in a bungalow just by the beach. We didn’t feel brave enough to move around without any Internet, so we decided to buy a SIM card so we could check maps, write to our hostess, and send pictures to our family. When we got to Chiang Mai we knew we wanted to do some activities, but there were so many involving animal mistreatment that it was difficult to find something that suited us. We finally chose a trekking activity and it was perfect. Our guides were local people who showed us the forest so we could fall in love with the landscape while they taught us about animals and plants. Aldara would like to thank AuPairWorld for helping her have the incredible experience of being an au pair – and of course for leading her to the New Horizons Survey. She is also grateful to Emirates for the opportunity to discover Thailand.